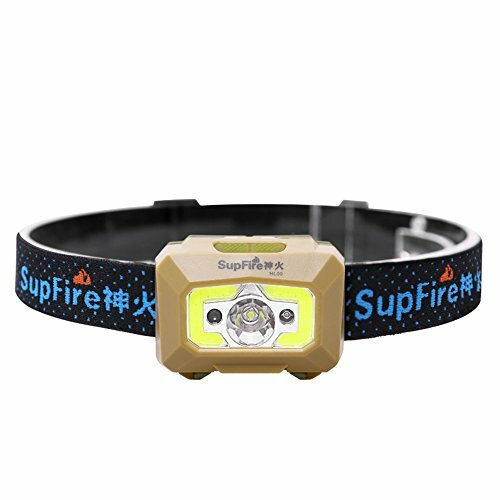 Supfire: The best choice for your flashlights. 1.60°ratation adjustment will help you adapt to various environments. 2.This headlamp can survive a 1-meter drop or being temporary submerged under water. 3.Two switches:normal switch & temperature induction switch.Press on the temperature induction switch will change to temperature induction mode,you can wave your hands within the distance of 10cm to control the light on/off. 4.White-red light & Five modes:Five modes(Main lamp/Auxiliary lamp/Main&Auxiliary lamp/Red/Strobe(red))can meet your needs for various surroundings.These Five modes can be used with temperature induction mode at the same time. 5.The pocket compact headlamp can be carried anywhere, which can be used for camping, hiking,running,cycling,repairing,indoor,outdoor etc. 6.You can charge this headlamp directly with an usb cable(included) via the usb interface of the headlamp,and it has a charging indicator. 1200mAh rechargeable battery inside can run 3 hours(high mode). 1 * Supfire HL09 Headlamp. ULTRA BRIGHT CREE LED: Super bright 500 lumen(max) CREE XPG2(R5) LED,white & Red light can be switched. CHARGE EASILY & HIGH CAPACITY BATTERY: You can charge this headlamp directly with an usb cable(included) via the usb interface of the headlamp;1200mAh rechargeable battery inside can run 3 hours(high mode). WATER-PROOF & SMART DESIGN: IPX5-rated water proof;Two switches:normal switch & temperature induction switch;It has a charging indicator and TPE headband,which make you feel comfortable to wear it.60°ratation adjustment will help you adapt to various environments. TEMPERATURE INDUCTION SWITCH: Press on the temperature induction switch will change to temperature induction mode,you can wave your hands within the distance of 10cm to control the light on/off. WHITE-RED LIGHT & FIVE MODES: Five modes(Main lamp/Auxiliary lamp/Main&Auxiliary lamp/Red/Strobe(red))can meet your needs for various surroundings.These Five modes can be used with temperature induction mode at the same time. If you have any questions about this product by SupFire, contact us by completing and submitting the form below. If you are looking for a specif part number, please include it with your message.